Glad to be of service. Just another couple of hours on the clock of time 'wasted' on this saga. I'm behind a couple of pages so friggin hard to keep up. If Robert wants to come clean, he will need someone to blame. And that will be his crew. He can make up a great story about how his "friends" as well as SKINS, exploited him and lied for him about the rules for breaking the record. Adding to that he can claim that his "friends" managed his web site and put up all the lies. Add in a dash of terrible childhood, some new found spirituality, a ton of remorse, and the background theme "I did it all for the kids" and he should make a lot more buck from that than by writing a book about a failed record attempt. He's closing in on Manhattan......Indiana. I just used gmaps and photoshop. Yeah I only just came back to the thread and saw the new theories about him being on 95. By that point it was too late to edit. I think it still gives most of the fact. But happy to post the PS file for people to edit. Slugburgers? Those won't work. Only sausage rolls will trigger another series of sub-6 miles. and he has begun taking a second break in the middle of the night. when all you have are bad choices. You blokes are friggin genius's. So us simpleton kids in our mom's basements (even though in the UK we don't have moms or basements), does this mean he cheated? This is interesting, probably nothing, since it only takes up about 10 minutes of their day, and they could have been scouting for gas or something. 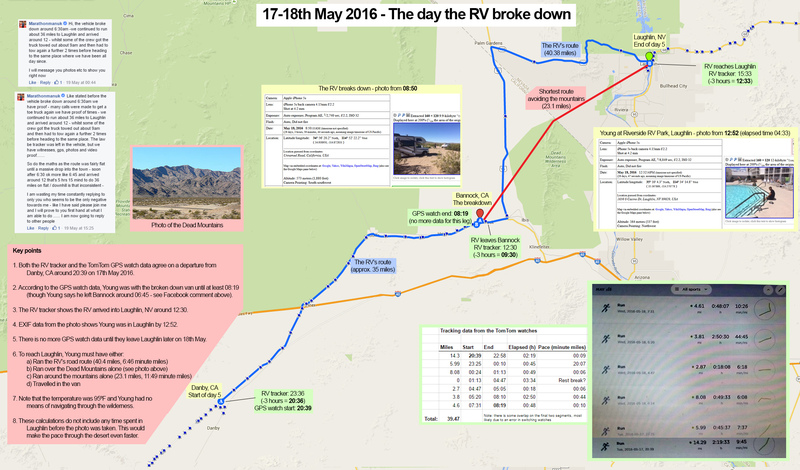 The tracker passes through Laughlin and into Arizona up Hwy 68 for the 13:30 check-in before heading back to the NV side, showing up south of their eventual hotel at 13:42, and then at 13:54 they are the hotel for their break. Tracker stayed on for 2 hours, until 15:33 Eastern, or 12:30 local time, just past the time RY should have ended his run. Pool photo is 12:52pm. 2) RY runs 21 miles on the road, and gets a short ride home (maybe even they give him a 15 mile boost, dropping him off outside Laughlin for the long downhill (where was that reference about the fast downhill into town?). That's weird. I got the numbers from a google sheet. No idea why it came out like that. I called out that as BS when I saw it. I am glad somebody followed up on this. when all you have are bad choices."